Pike Motorworks transforms Capitol Hill with Division 9 Flooring imprint. 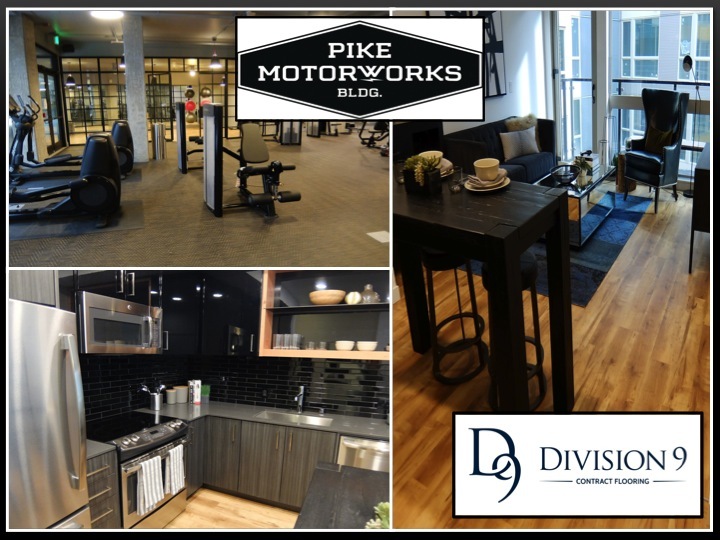 The Pike Motorworks Apartments recently opened at 714 E Pike in Seattle. The location was known as auto row in the early 1900’s. More recently, it housed BMW and Mercedes dealerships. 260 apartment units now sit above 20,000 square feet of retail space. The building incorporates some of the historic building that once stood at the site with reclaimed wood columns and beams. The project is one of many that have transformed Seattle’s Capitol Hill neighborhood from a somewhat eclectic area to a mass appeal mecca for young tech professionals, also known as Millennials. Those Millenials are flocking to Capitol Hill. In 2009, Capitol Hill created a Historical Preservation District. In an effort to remain true to the history of the area, many of the buildings are using repurposed materials from the older buildings. At the very least, these newer buildings are using the facade of the buildings that once stood in their place. In exchange, they’re able to build seven stories up, one floor higher than city code allows. Seattle is one of the fastest-growing real estate markets in the country with high demand and low inventory. Housing prices have increased to keep up with the demand, as have rental rates. The commercial real estate market in Seattle is reaching new heights and Seattle has become known as a hotbed for tech companies. Many of the companies, like Amazon, set up corporate offices in Seattle. Other companies, like Apple, want a presence in the Seattle market. Rental rates at Pike Motorworks Apartments reflect that. They range from $1765 per month and top out at $3765. Click here for more info on Pike Motorworks Apartments.